Movement is one of the characteristics of every ambulant human being; we move from one place to another to get things done or to visit family and friends. There are different modes of transportation that aid our movement within society and it’s essential to recognize there are people who need our support in understanding how to use them. It is undeniably painful when a set of people, due to their disabilities and cognitive level, are unable to move from one place to another as a result of not understanding the meanings attached to objects, gestures, issues, and relationships. In an effort to reduce this ambiguity in the social system and to support people with ASD with travel skills, there is a need to break the journey down into stages supported by relevant aids. This article will focus on the use of visual aids to develop travel skills while traveling on public buses. Timers can be used to let the individual know when the journey will start. The timer can be set 10 or 20 minutes prior to the commencement of the journey. Please note that it is advisable for the timer to have a sound at the end which will serve as a cue as some individuals with ASD may find it difficult to count the time, but if the timer is supported with a sound when it finishes, it will aid their understanding. A countdown system can be helpful either in a decreasing or increasing method. For the decreasing method, you can remove the object one after the other until finished. For example, have the parent/carer count five objects on the table and tell the individual with ASD that when the objects are finished, he/she can go out. The parent/carer will take each object at intervals while making the individual with ASD aware of how many are still left. Please note that the transition method should be used based on the need of the individual. This is not generic. Moreover, the individual with ASD should close each stage completed in the flip book to enable him/her to be focused on the next stage. For example, after walking to the bus stop, the flip should be closed and focus should be on the next step. 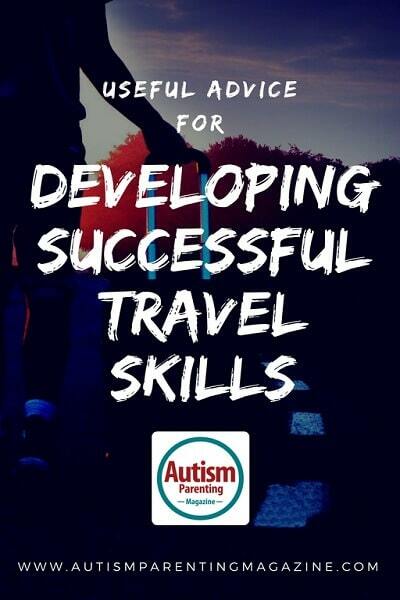 As time goes on, it is important to gradually reduce active assistance in order to enable the individual with ASD to develop some independence while traveling. In conclusion, it is imperative to note that all these travel training stages are important and fundamental while developing skills. Keep in mind different individuals with ASD have different cognitive abilities. It is always important to check your student’s care plan, likes and dislikes before engaging him or her in this activity. Also, there is a need for strategic risk assessments before embarking on travel with an individual with ASD. Ayodeji Oyewale works as a lecturer at Nash College Bromley United Kingdom. He has four years experience of teaching students with ASD. He has contributed immensely to the development of appropriate life skills for the students with ASD. Ayodeji has a Bachelor degree in Sociology and MSc Human Resource Management as well as different teaching qualifications. He is passionate about supporting and helping people with learning disability to break through all limitations.